Each Holy Week Pope John Paul II spoke to university students who came to Rome from all over the world to participate in the UNIV youth congress, an annual meeting begun in 1968 with the encouragement of St. Josemaria Escriva. 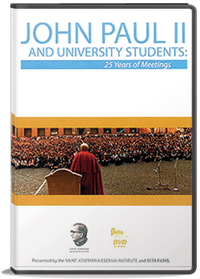 Highlighting moments from 25 years of these meetings, this video captures Pope John Paul II's great sense of humor, his affection for young people, and his ability to understand and relate to today's youth. The pope laughs and jokes, but he also challenges these young faithful to live up to the full demands of the Gospel. This candid and heartwarming look at the pope offers and invaluable portrait of the Head of the Church who had so captured the hearts of the world. Subtitles in English, Spanish, and French.